Embattled MMA star Conor McGregor was invited to drop the ceremonial puck prior to Saturday's Boston Bruins game against Columbus. The Bruins were celebrating Irish Heritage Night in honor of St. Patrick's Day. McGregor was given a custom green Boston Bruins jersey, although he held it in his hand rather than wearing it. 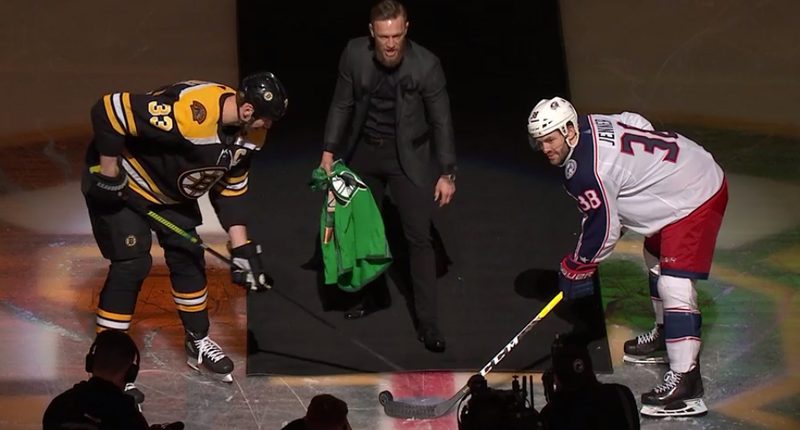 McGregor was pumped up as he approached center ice to drop the puck with Bruins captain Zdeno Chara and Blue Jackets assistant captain Boone Jenner. McGregor really fired up the Boston crowd, and apparently the Bruins as well as they beat the Blue Jackets in OT 2-1.